MAK pellet grills are US built by the owners of MAK Metals, who took their interest in BBQ to the extent of producing their own range of smoker grills. They use a unique digital temperature control system called 'Pellet Boss' which takes information from a thermocouple inside the oven and controls both induction air and fan speed. Remote control allows you to check status and control cooking from up to 300 feet away. The MAK firepot is made of heavy grade stainless steel, and comes out for cleaning by removing one pin. The hopper on MAK pellet grills has a quick emptying facility, making it easy to change the flavour of the pellets. Cooking grids, drip pans, handles, firepot , and grease bucket are all made of stainless steel. 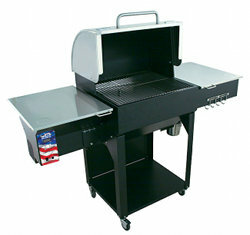 Optional full upper grill grates double the cooking area. Without the extra grates, the height of the cook-box will accommodate large cuts of meat and turkey. 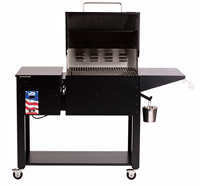 Dimensions H 44" W 37" D 23.5"
Upper grill grate - increases cooking surface from 380 sq.in. to 760 sq. in. The MAK 2 Star includes a meat temperature probe as standard. More can be ordered as options. There's an 'over the flame' region for searing meat. Dimensions H 49" W 60" D 25"